Olmos will be playing a charming professor of Religious Studies in a huge story arc in the sixth season. 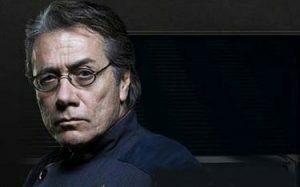 It’s going to be strange seeing Olmos going from ‘BSG’ to his role in ‘Dexter’. I just want him to say “So Say We All”. I think whoever is in charge of casting for ‘Dexter’ needs to get some kind of award. All these excellent actors from this upcoming season and past season have really made the show a lot of fun to watch. I think Edward’s presence will attract tons of new viewership to ‘Dexter’. Geek Deal of the Day!!! Battlestar Galactica: The Complete Series (with Collectible Cylon) Blu-ray and Dvd!!! 67% Off!!!! Check Out The Trailer For ‘Battlestar Galactica: Blood and Chrome’!!! This entry was posted on Tuesday, May 24th, 2011 at 3:09 pm	and is filed under Film, News. You can follow any responses to this entry through the RSS 2.0 feed. You can skip to the end and leave a response. Pinging is currently not allowed. « Geek Deal of the Week!!! Ocean’s 11, 12, 13 on Blu-Ray for 50% Off!! !